There’s a short compilation of stories about U.S. presidents playing poker today over at the N.Y. Times, pulled together Michael Beschloss. All of the stories are quite familiar to anyone who has looked into the subject before, but for those who haven’t it serves as a quick introduction to some of the highlights. Actually anyone who’s read James McManus’s 2009 history of poker, Cowboys Full, will be familiar with almost of the stories in the piece, so much so that I’m kind of surprised Beschloss doesn’t at least acknowledge McManus (a former NYT columnist) in his article. For example, when rehearsing the story of the pre-Iron Curtain speech game of poker involving Harry Truman and Winston Churchill (something I’ve written about here), Beschloss includes all of the same details and even implies the same connection McManus does between the Americans’ good showing in the game and Churchill’s declaration of alliance with the U.S. in his speech the day after. He also echoes McManus’s connections between cold war politics and poker, although the discussion of the Kennedy-Khrushchev showdown over the Cuban Missile Crisis (and its interpretation as a poker-like confrontation of high-stakes raises and bluffs) has been explored by many other writers as well. The article-concluding anecdote about former Secretary of State George Shultz comparing Ronald Reagan’s bargaining with the U.S.S.R.’s Mikhail Gorbachev as “the highest stakes poker game ever played” is the only one included that is not mentioned in McManus’s book. 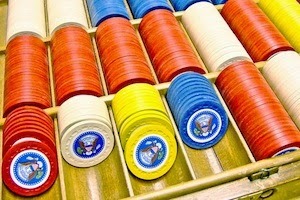 Meanwhile, no mention of Barack Obama’s poker-playing seems a strange omission in the NYT piece. Anyone with an interest in presidential politics will find these stories interesting, though. Those interested in poker will, too. And if you’re like me and interested in both, you can’t get enough of this stuff, even if you’ve read it all before.